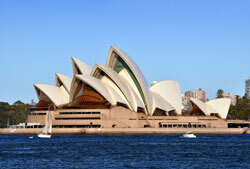 Sydney, Australia, is the capital of the state of New South Wales and is the most populous city in Australia. Consider it the New York City of Oceania. Sydney is a thoroughly modern and prosperous metropolis with all the hustle and bustle you’d expect from a commercial and business hub, but not at all lacking in the relaxing, natural green and seaside spaces you expect from your adventures down under. Here is a very brief selection of reasons you should visit Sydney. Number one on the list is the Sydney Opera House. The world famous landmark is, in my opinion, one of the true wonders of the modern world. Its unique, futuristic shape belies the fact that construction began in 1959 and was completed in 1973. The Sydney Opera House looks like a cross between a sci-fi movie spaceship and the ever-hatching egg of an enormous sea dragon. And this organic-yet-artificial shape is perfectly at home overlooking Sydney Harbor, sort of bridging the gap between the natural form of the sea and the great steel and glass glamour of Sydney itself. But seeing the exterior of the opera house is hardly enough – the real reason this is on the list is because of the world class performances offered within. From Madama Butterfly to Comedy to Rock to Jazz there is never a shortage of entertainment for your amusement, amazement and education. The selection is on par with any in the world and the performance and accommodation is unrivaled. One of the themes harped on by the peanut gallery whenever someone mentions Australia is its abundance of dangerous animals. It’s true, Australia is home to many of the world’s most poisonous or downright vicious beasts. Of those creatures, none is more impressive than the Great White Shark. No matter how scared you might be of getting eaten by some vicious fishes, wouldn’t you feel a bit ripped off if you went all the way to the land down under and didn’t at least see a man eating monster from the depths? I know I would. Well, do not fear – you can do a whole lot more than just see one. You can get in the water with one and come inches from its rows upon rows of razor sharp teeth. At the (I think quite appropriately named) Manly Sea Life Sanctuary you can take advantage of the “Shark Dive Xtreme” to hop in the water with Grey Nurse sharks. OK, so they’re not Great Whites, but they sure look scary enough and no one back home needs to know that they literally cannot tear you limb from limb. Diving with these sharks supports marine life conservation efforts as well as being a once in a lifetime experience. Do something good that feels good? Yes, please! 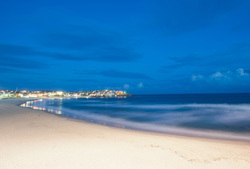 Bondi Beach is, deservedly, one of the world’s favorite beaches and among the most popular in Australia. Beautiful both in photographs and in person, Bondi Beach stretches a meager one kilometer crescent of golden sand and azure surf. Besides bathing, surfing and beach-body-watching, Bondi Beach boasts some great nature hikes along the coast and even along specially constructed cliffside paths. Bondi is one of the few developed coastlines that is well served by dining and shopping while still remaining beautifully unspoiled. But don’t take my word for it, just do a quick Google image search. Once you’re bored with natural splendor, bikini babes and getting baked by the admittedly harsh Australian sun you can enjoy a night of drinking and dancing at any of the nightclubs just off the beach. Most of these cater to the over 35 crowd, but there are some for whippersnappers as well. You could spend a few days at Bondi and not repeat the same nightlife experience twice. These three options barely illustrate the diversity that Sydney offers to her visitors. A full list could be the subject of several tour books, and has been. Absolutely visit Sydney when you come to Australia.